Heat oven to 350°F (325°F for dark or nonstick pans). Grease or spray bottoms and sides of one 10-oz custard cup and two 8-inch round cake pans. Make cake batter as directed on box. Pour 2/3 cup batter into custard cup; divide remaining cake batter evenly between cake pans. Bake 23 to 28 minutes (26 to 33 minutes for dark or nonstick pans) or until toothpick inserted in centers comes out clean. Cool 10 minutes. Remove cakes from custard cup and pans; place rounded sides up on cooling racks. Cool completely, about 1 hour. Into small bowl, spoon 3/4 cup frosting. Tint with blue food color to make light blue; set aside. Frost sides and top of cake with remaining white frosting. To add waves, frost lower side of cake with blue frosting. Dip a fork in a few drops additional blue food color; swirl in blue frosting on cake to add wave effect. Sprinkle top of cake with colored sugars. Tie hair of fashion doll in ponytail. (Keep swimsuit or clothes on doll.) Wrap body of doll with plastic wrap, covering bustline and leaving arms free and shoulders uncovered. With 2 fruit snack rolls, wrap plastic-wrapped portion of doll, overlapping rolls and pressing to stick together. Wrap third snack roll around legs and extend 2 inches beyond feet; press together to form a fin shape, trimming if necessary. Place doll in seat on cake. To make starfish, on surface sprinkled with granulated sugar, flatten each gumdrop to make 1 1/2-inch round. Using scissors, cut 5 wedges from each gumdrop round to form a star. Pull gently to extend points of stars. Decorate cake and serving plate with starfish and sea creature candies. Store loosely covered. Place Fruit Roll-Ups® snack rolls in the refrigerator for a few minutes to help release from plastic wrapper, if necessary. For a sand effect, sprinkle top of cake and around serving plate with turbinado sugar (raw sugar) instead of blue and purple colored sugars. 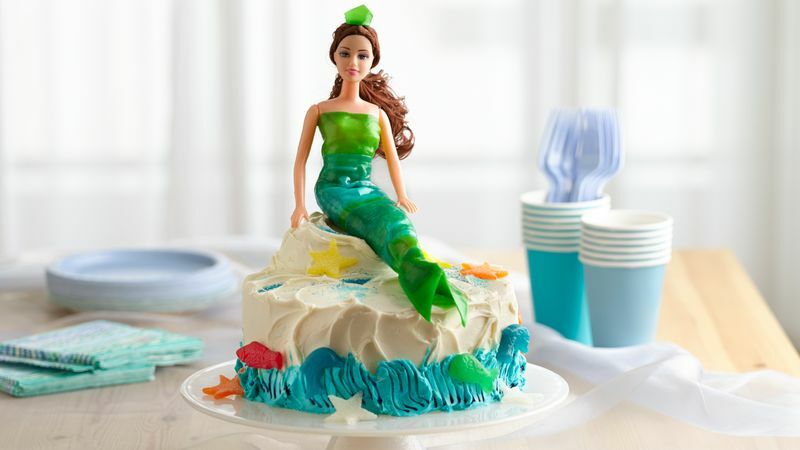 Get a party menu, prep guide, tips, party games, activities and more for an Under-the-Sea Mermaid Birthday Party!